Auricular acupuncture sometimes is called ear acupuncture, or auriculotherapy. It is a special acupuncture treatment only treat with the points on the ear (auricula). The theory and use of auricular acupuncture can be tracked back to ancient China. However It was formally discovered and developed by a French Doctor – Dr. Paul Nogier, a neurologist. Dr. Nogier had one patient with sciatica. He could not help the patient relieve the pain but let him go. One day this patient came back and told him that his sciatica pain had been cured by a “Folk practitioner”. This “folk doctor” stimulated one point on his ear and left a mark. Dr. Nogier was very curious to find this point also helped other patients with sciatica pain. Later through research with his students and colleages, Dr. Nogier found a few other points which are also effective in treating corresponding symptoms. A few years later, Nogier published his research paper in a German medical journal. In the article he stated that the whole ear was innervated by numerous cranial and spinal nerves, especially the vagus nerve. 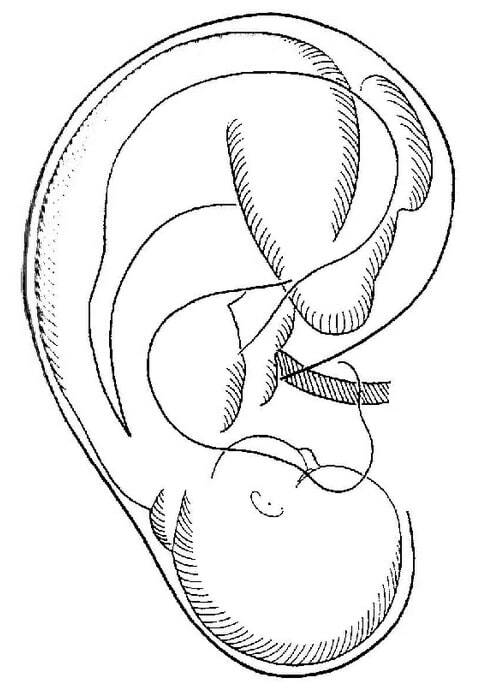 The entire ear can be described as a “Inverted Fetus”. What can auricular acupuncture treat? Such as muscle strain or sprain, neuralgia (nerve pain, as sciatica pain, trigeminal neuralgia), headache, migraine. Auricular acupuncture is highly recommended for people who wish to quite smoking. auricular acupuncture not only help with withdrawal symptoms as irritability, anxiety, insomnia, but also help with the cravings associated with nicotine addiction. In addition, ear acupuncture is also renowned for cocaine or heroin addictions. Assisting in poor sleep and/or anxiety. Relieve pain from stomachache, arthritis, etc. What to expect in a auricular acupuncture treatment? Auricular acupuncture can be performed solely or combine with a regular acupuncture treatment. Generally before the treatment, your acupuncturist will try to find 3~5 acupuncture points on your ear. The chose of the points can be based on your diagnosis, or can be the most sensitive points on palpation on your ear (the more sensitive the points are, the more effective the treatment is). Then normal acupuncture needles, ear seeds (magnetic or herbal seeds on a small piece of adhesive tape) or ear tacks (very small needles with an adhesive tape) will be used to stimulate the points. Normal needles will be removed after treatment, while ear seeds or ear tacks can stay there for a few days or up to one week. You may occasionally feel very tiny sting when the needles are inserted to the points. If use ear seeds you will not fee any pain, but slight pressure sensation on the points. Actually you need press or massage the seeds for a few seconds until you feel a worm sensation on the ear, 2~3 time per day to give you extra stimulation. If treated by a well-trained practitioner auricular acupuncture is considered as safe with no or little adversed effect. The needles used in our clinic are all sterilised single use disposable needles. For ear tacks we choose the best Japanese brand -Seirin Pyonex. They can be left in the ear points for generally 3~4 days, up to one week.